Sorry about not getting up those pictures from the convention I promised you guys! I caught the black plague and have been deathly ill the last week. Not really, I caught the didn't-get-more-than-25-hours-of-sleep-in-two-weeks-due-to-con-and-finals virus. I'm doing reasonably better now though. If you're a regular reader of the blog, or even if you've just looked around a little bit, you've probably seen one of my Portal projects or heard me mention the series in passing; and that is because they easily rank in my top 5 Video Games. Portal sits at #5 and Portal 2 is easily #2 favorite of all time. 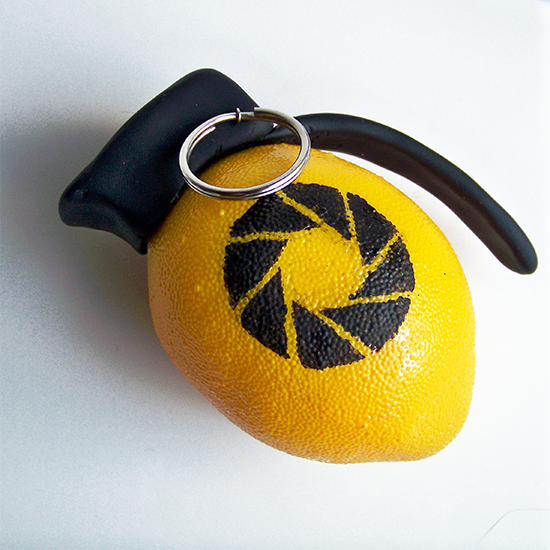 A Lemon-grenade, popularized by Portal 2. Portal is a vastly popular game with tons of rabid fans. Today I'm going to talk about the series a bit and some of the many things I have made to show my love for it, maybe hint at some things I hope to make in the future, and show you other people's inspired creations that make my heart happy. First things first, I am a wimp. Here's why: I have an irrational fear of being shot in video games, I think it's the noise/sound effects. I don't usually play any FPS (first-person shooters) like Call of Duty, Gears of War, Halo, and Portal. Now Portal definitely stands out among that list because it's not a war game, or even a usual shooter due to the gun itself. As the name implies you are shooting portals. You play a test subject trapped in a science lab who is forced to solve puzzles with the help of your marvelous portal gun, while being observed by a snarky possibly murderous AI. That's all I'll tell you about the plot, but suffice it to say I thought this game would be great for me since there weren't any people to shoot you. I was wrong about getting shot but it still was one of the best gaming experiences I have ever had. It is one of the strongest burning flames of fandom in my cavernous geeky heart, and if you have not, I advise you to play both the games very soon. I will do my best not to spoil anything here, but it may be best to just visit this post after you've already played. For Christmas my first year on my own, my three room mates and I exchanged presents on New Year's Eve during a Batman movie marathon; I received portal cookie cutters from ThinkGeek. They are super awesome, and even though I've only had a few excuses to use them since I got them, they are one of my favorite possessions and I keep the fancy tin they came in displayed in my office, which you can see below. Here is a cell phone picture of one of the only really beautifully iced sets I've ever done. 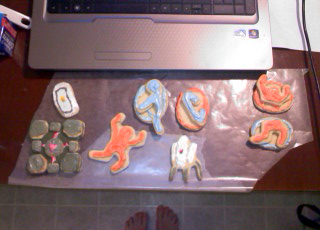 Usually they just get eaten, I never really have people to show off my cookies to...that sounded a little odd. 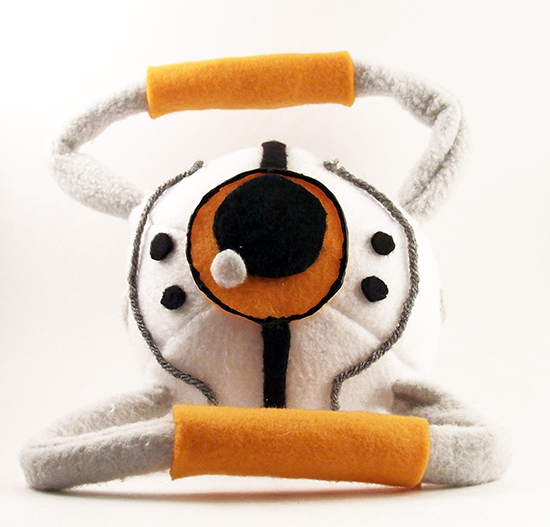 This is a plushie I designed after I finished the first game and then took with me everywhere for the next month or so. It's based off of these robot-ish things in the game, they're called personality cores. Everything in portal is really well designed which is part of why I think the fans can go so crazy creatively; we have so much to work with. 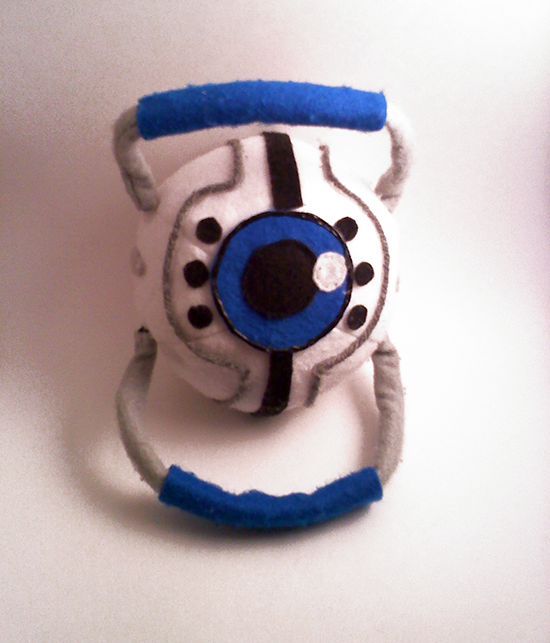 Anyway, the prototype was made out of felt which is why he looks so fuzzy and a little disheveled. This one was made with fleece like the rest of my plushie creations and I actually sold a handful of them in my shop. Since I'm considering going to sell at more conventions I think I'm going to start building up a little army of these guys to take with me. If anyone is interested in one, I do all 8 variations from the two games, just comment below or message me on Etsy if you're interested. 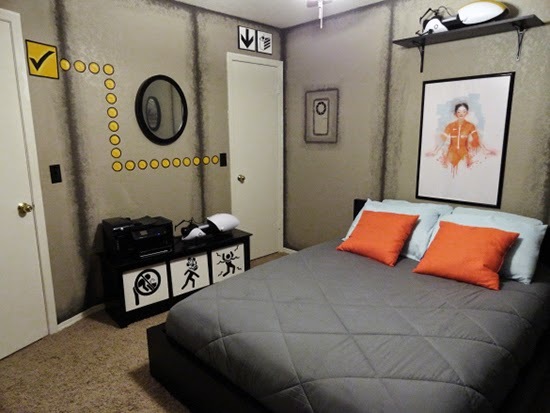 Since portal inspires such a powerful love in me I thought it was a perfect companion for Valentine's Day which caused my brilliant brain to come up with this great project earlier this year. You can make as many as you want for all of your loved ones here with this tutorial and template I made! My next project was inspired by this webpage. (Please click it, it's a soul calming experience and I have totally been listening to it while writing this post) I discovered it shortly after I finished the second game and honestly could just leave it open on my laptop for hours at a time while I went about my day. It was the perfect background music. 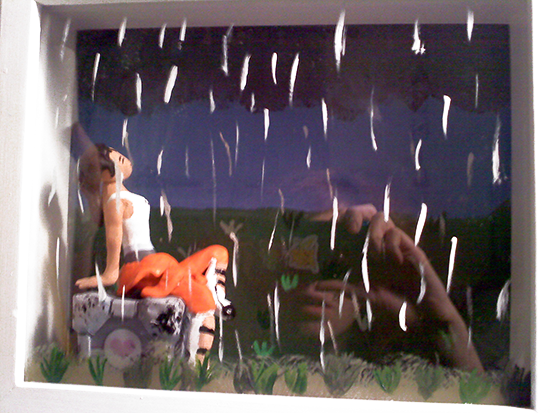 One particular day I remember being struck by a bolt of inspiration and beginning to sculpt the legs of the girl in the diorama below. I stayed up all night sculpting, painting, cutting, and gluing to create this little work of art which I was soooo proud of, all while listening to that song of course. Unfortunately I didn't pick a good place to hang this very heavy shadowbox from, and it fell down and everything inside broke. Sadface. Here is a shot of my office, where you can see a turret painting, whose eye glows(! 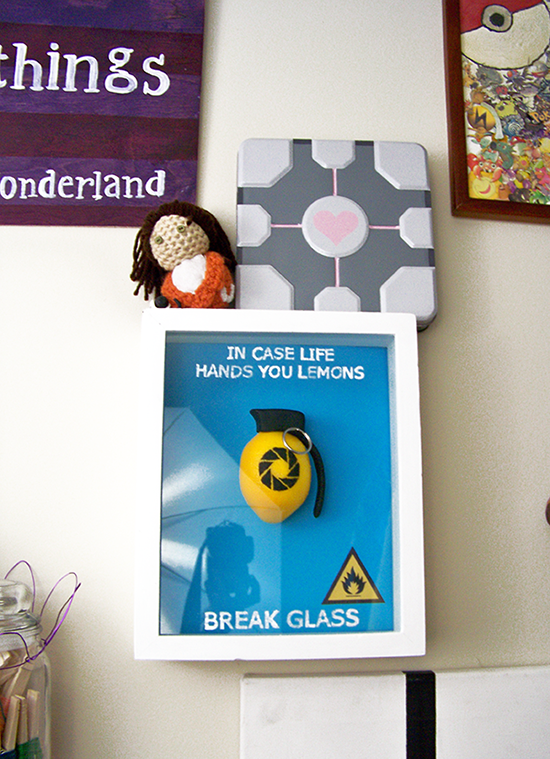 ), and my Portal lemonade display. Oh! If you look on my corkboard next to my lamp you can also see the companion cube card too, that's funny. 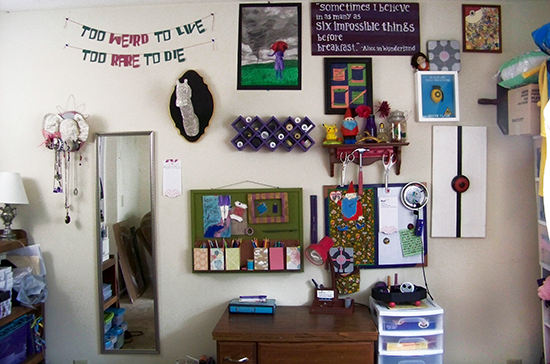 All of my projects really take a backseat compared to this lady's room though. I have always wanted to be able to just give my room a singular theme but I have always loved too many things and had too much junk/craft supplies and equipment to make that happen. She has truly taken the cake with her interior decorating skills! Check out her blog in the link above to see the whole mathmatical process. I wonder if they will ever make a third Portal game? I'm not sure if there is any room for it, the series concluded satisfactorily for a character but I think there are still things that could be explored about the world, mostly the labs of Aperture Science. If you've played the games, what was your favorite moment from them? If not, do you think you might play them?